Jadhav said that NCP chief Sharad Pawar will speak on the future path of the party, besides co-ordination in party and in government, at the meeting. The lone Shiv Sena minister Anant Geete had to fall in line by taking charge of the Heavy Industries portfolio, said NCP president Bhaskar Jadhav. With Shiv Sena MP Anant Geete finally assuming charge as Minister of Heavy Industries in Narendra Modi cabinet after ‘haggling’ over “significance” of the portfolio, the NCP on Thursday termed the saffron party as a “paper tiger” who is shown the “right place” by its alliance partner BJP in allocation of berths. “In BJP’s view, Shiv Sena is worth only one ministry and the party’s objections were also overruled. 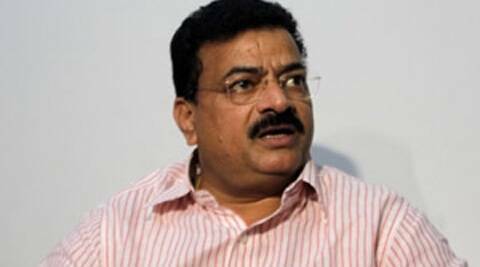 The lone Shiv Sena minister Anant Geete had to fall in line by taking charge of the Heavy Industries portfolio,” NCP president Bhaskar Jadhav said. Shiv Sena, which is the second largest NDA constituent with 18 MPs, was unhappy over the allocation of the portfolio and has reportedly sought the ministry of significance and also more berths for the party which is an all-weather ally of BJP. Jadhav also recalled how BJP tried to reach out to Raj Thackeray-led Maharashtra Navnirman Sena during campaigning for Lok Sabha polls. Responding to a query on whether NCP is in favour of the change of guard in Maharashtra ahead of Assembly polls which are due later this year, Jadhav said, “It is not needed. We are not demanding this as there is very little time (left for elections)”. On allegations levelled by Congress leaders like Narayan Rane and Patangrao Kadam that NCP was responsible for defeat of Congress candidates, Jadhav replied, “Even Congress leaders are not taking these allegations seriously”. Jadhav said that NCP will celebrate its 15th Foundation Year with convening of a meeting of party office-bearers. “Senior leaders from all over the state will meet at Shanmukhanand Hall in Central Mumbai on June 8,” he added. Jadhav said that NCP chief Sharad Pawar will speak on the future path of the party, besides co-ordination in party and in government, at the meeting. “This will enable party men to organise similar meetings at Assembly constituency level on June 10 which is the Foundation Day of the party, where people from all sections of society will participate,” he said. To a question on how the party event will be celebrated in Sindhudurg since the district unit there is sacked and Deepak Kesarkar having resigned as Sawantwadi MLA, Jadhav said that Kesarkar continues to be NCP MLA. “We have just given a show cause notice to the Sindhudurg unit and will hear their side. There will be no injustice,” he said. The Sindhudurg NCP chief Bal Bhise had been sacked for allegedly working against Nilesh Rane, the Congress candidate from Ratnagiri-Sindhudurg Lok Sabha seat.